After the pedicure, I decided to scope out Cafe Max…and the rest is history (haha). I met Max on that first visit, and since then, we’ve become close friends along with his partner, Yuki. There was a period of time in late summer/early fall where I was at the cafe nearly every evening, doing work or keeping company with Max and his employees. I have joked that I am Cafe Max’s “biggest investor” because of the cash I have spent on the cafe’s offerings. 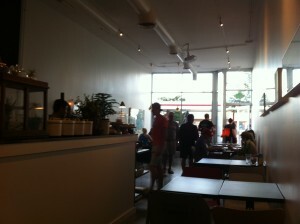 View of Cafe Max from the back table. At Cafe Max, patrons experience a cozy, almost “living room”-like environment: there are magazines and books available to peruse while patrons wait for their food or drink. The menu itself is different from what folks would expect in Denver: instead of the same ol’ pastries, Max has all unique desserts, either made in his kitchen or from local businesses (e.g., Humble Pie). In addition, Cafe Max’s menu has breakfast items (served all day!–my favorite! ), continental plates, and coffee products (French Press, Cappucino, *authentic Cafe con Leche, and strong, bold cold coffee from La Colombe). If coffee isn’t your preference, there are also teas from all over the world to choose from; both caffeinated and herbal teas are available. Cold drinks include San Pellegrino sodas and sparkling water, organic juices, and unique offerings of beer and wine. 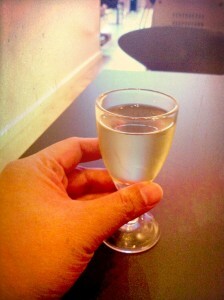 prezzolini prosecco at Cafe Max; what a cute little glass! 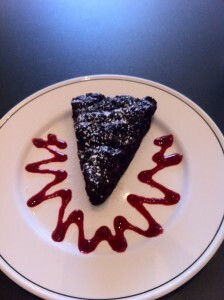 Cafe Max’s menu items are also accommodating to those with a gluten intolerance, having dishes and desserts gluten-free. Some items are also lactose-free. I have practically eaten my way through the whole menu over the course of the past nine months: my favorite dishes are the Frittata w/organic greens, the Organic Salad w/goat cheese, and the Prosciutto Panini (also served with organic greens). The entrees are light and prepared to order. Cafe Max is not a place to grab-n-go quickly; Max and Yuki want patrons to linger, take some downtime at the cafe between business meetings, errands, etc. Cafe Max is open on Mondays thru Saturdays from 8:30am to 10pm. On Sundays, the cafe closes at 6pm. When you get the chance, Denver, come visit Cafe Max and experience the place firsthand. If you are lucky, you will have a chance to meet Max; he is very approachable and kind with an interesting sense of humor. You can visit the cafe on the corner of East Colfax Avenue and Josephine Street: 2412 E. Colfax Avenue, Denver 80206. Mm, I never knew that curbs had different flavors. That was the school’s name; I know, “Dong” in the Chinese language does not mean anything bad, but transliterated/phonetically translating it to English makes it sound too wrong. How dirty is your cook? – Never touch the food with bare hands, even if hands are clean. Handle with a cooking utensil or with plastic gloves over hands. – Never let food touch a public surface (countertop, etc.) or else it is contaminated. – Never pick up trash/things off the ground with bare hands and then use hands to handle food–even if handling food is with a cooking utensil! Germs could transfer through the utensil. There are many other ways to reduce germ contamination, but these are a few starters. I bring up this topic mainly because of an incident my boss had at a “dive” burger joint he went to earlier in the weekend. He said he watched (with sheer horror) as the cook behind the counter took out UNREFRIGERATED, raw chicken breasts, throw the meat onto the grill with his bare hands, and then, without washing his hands, proceed to arrange the garnish setup (tomato, lettuce, etc.). Unfortunately for my boss, he got food poisoning from such an incident; fortunately, he’s okay now. Just goes to show–if possible, watch how the cook handles your food next time you eat out! Posted on June 30, 2008 Categories #foodie, dining out, health, restaurant1 Comment on How dirty is your cook? I took several pictures of my lunch from today, but this is the only one I shall feature. It was the dessert, and I’m not sure if you can tell or not, but this little dessert was really tiny. It would probably not even pass as a kid’s dessert in the US; probably would pass for a toddler’s portion. Anyway, as the title says, today I discovered that in some restaurants in Japan, there are designated sets for men or women; this little tidbit of information stunned me a bit as I listened to my Japanese friends explain the difference between the two sets. Men’s sets are bigger in portion, have certain foods that are more “manly”, etc. Meanwhile, with the majority of Japanese women who actually diet as a “hobby” (!! ), the women’s set is usually a lot smaller, healthier (which is a good thing), and a few other things that I forget. I feel like such set menus would not/could not exist in the US; after all, the society in the US is a bit more balanced (in some ways) when it comes to gender. Both men AND women want to be healthier, eat better portions, etc. With the idea of sets for each gender in Japan, it goes to show how different and more traditional the society still is. I mention this fact since my friends and I actually ordered the women’s set at the pasta restaurant we went to. It came with a generous portion of pasta with a salad and this dainty dessert. I forget what the men’s set had–don’t think it had salad though. Currently reading The Fortune Cookie Chronicles by Jennifer 8. Lee and so far I find it a fascinating read. There are many things I already knew about Chinese food in the US (that most of it isn’t authentic); after all, my parents explained this to me awhile ago since they still operate their restaurant in Virginia. In the end though, what foods stay “authentic” to their native origins when they enter a foreign country? After all, I’m sure most of the stuff I eat/crave at Korean, Vietnamese, Thai, Japanese, Indian, et. al. restaurants are not 100% authentic; we can say that most of the foods are adapted for the American palate. It’s the same thing with truly American food crossing over into other countries such as Japan. The burgers in Japanese McDonald’s are definitely different from the burgers here in the U.S. There are different combinations and such; there’s a shrimp burger in Japan! You wouldn’t find such a thing here in the US. Anyway, back to more reading. Just wanted to pause a moment and reflect on this aspect.